This weekend, Ghana's three surviving clubs in Africa, Asante Kotoko, Hearts of Oak and Liberty Professional, go into action in their respective first leg qualifiers for places in the last eight of the Confederations Cup contest. While Kotoko and Hearts will be home to their respective opponents, Liberty will be away in their encounter in Sudan. And as Kwame Asare Boadu writes, vengeance is written boldly on the mind of Kotoko, and they have served notice to that effect, as they confront Wydad Athletic Club (WAC) of Morocco at the Kumasi Stadium on Sunday. Losing the Cup Winners Cup to WAC at home before a sold-out partisan crowd including their Life Patron, Otumfuo Osei Tutu II, and the Vice-President of the Republic, Alhaji Aliu Mahama, on December 8, 2002, could be enough justification for Kotoko to harbour a pent-up feeling against the Moroccans. Sunday offers the last opportunity for Kotoko to make an impact in Africa this season and take a giant stride towards rewriting history as trailblazers of continental honours in Ghana. 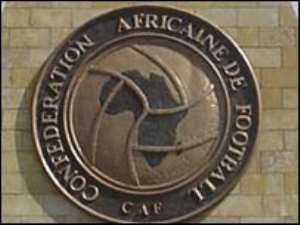 Having slumped from the more prestigious Champions League to the Confederations Cup after bowing to UMSA of Algeria, the two times African champions cannot afford to take a back dive in the Confederations Cup. Coach Hans-Dieter Schmidt says he is satisfied with the build-up to the match. He insists that Kotoko are battle-ready for WAC. The Moroccan side obviously have an inkling of the task ahead and are in no mood to take chances. They have postponed the intended trials of two of their trusted cards, Mourad Deyi and Jacques Goso, in Europe until after the match against Kotoko. But there seems to be a big gulf between WAC of 2002 and WAC of 2004. They nearly They also seem to be in a sort of technical crisis as they are under pressure to find a replacement for Mustapha Cherif who has just called it quits. Most of the architects who did battle against Kotoko in 2002 are still around. In attack Talha who fetched the decisive goal that saw WAC winning the cup on the away goal rule and the lanky Mourad could still pose problems for Kotoko missed out of Africa next year, placing fourth in the just-ended Moroccan first division league. They also seem to be in a sort of technical crisis as they are under pressure to find a replacement for Mustapha Cherif who has just called it quits. Most of the architects who did battle against Kotoko in 2002 are still around. In attack Talha who fetched the decisive goal that saw WAC winning the Cup on the away goal rule and the lanky Mourad could still pose problems for KotokoKotoko would once again draw on the inspirational play of crowd favourite Charles Taylor on the flanks, to be supported by Michael Osei and the attacking pair of Frank Osei and Shilla Alhassan. Stocky striker Nana Arhin Duah may not be fit for the match, but the available materials are capable enough to sail through. • Accra Hearts of Oak expect technical head Ernst Middedorp back to the job on Thursday just in time before Sunday's Confederations Cup game against AS Douanes of Senegal in Accra. Michael Quaye writes. But aside the unpleasant task of preparing without Coach Middendorp, Hearts will be without suspended midfielder, Francis Bossman, who is expected to leave for trials at German side, Armenia Bielefeld, sometime this week. Bossman, first suspended after receiving the red card in the game against Stade Malien in Bamako and now suspended after attracting a second yellow card since returning from suspension in the game against Etoile du Sahel in Tunis, now risks perpetual ban from continental football this year if he is suspended again. The vacuum of the midfielder's absence might be filled by skipper Amankwah Mireku who was expected to return with the Black Stars from Uganda yesterday. In the coach's absence, however, his deputies, implementing what club sources say was a programme he left behind, supervised Hearts' 2-0 defeat by the Black Satellites in Accra last Sunday. Mireku returns in the company of Lawrence Adjei, Sammy Adjei, Dan Quaye and Dan Coleman who were all absent when Hearts lost to the Satellites. The German left for his native country last Thursday for “medical attention,” but a South African media report linked him to the six-month-old vacant job at Orlando Pirates who are also campaigning in the Confederation Cup. But Hearts IMC member in charge of finance, Mr Clement Dodoo, told the Graphic Sports that Coach Middendorp's return flight ticket was funded by the club as part of Hearts' contractual obligations and branded the report as “ordinary speculation”. And when Mr Dodoo calmed nerves that “there is no cause for alarm,” he might as well be referring to his confidence in Coach Middendorp's abilities to take the club into the money zone of the competition. Under Coach Middendorp, Hearts' only loss in Africa was the 1-0 defeat by Etoile du Sahel in Tunis which led to their relegation into the Confederations Cup. Douanes have scored in all matches, the last being a 3-0 win over Camerounian side PWD at Rufisque. Liberty's fairy-tale campaign in Africa takes them to Sudan where they play as guests of El Hilal. Successive conquests in Luanda and Tunisia have raised the profile of the young Ghanaian side in their maiden appearance on the continental landscape. Osei Akoto, David Boateng, Michael Helegbe, Jonathan Quartey, Mustapha Essumang, Issifu Ansah, Eric Bekoe, Stanley Afedzi, Felix Baffoe, David Addo, Osei Agyemang, Wahid Mohammed, Kwame Darko and goalkeepers Patrick Antwi and Kotei Blankson are among players making the journey to Khartoum. Known for their strong reliance on collective play, these players have shown little respect to opponents and look certain to add El Hilal to their victims in campaign reminiscent of Greece's annexation of the European title.